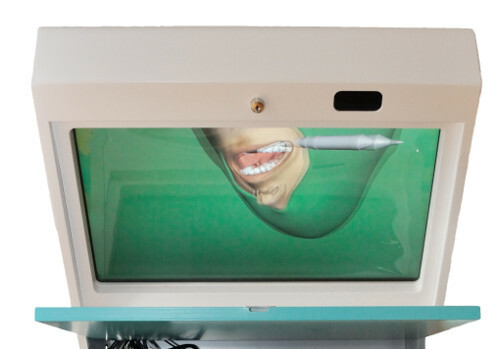 Our surgery simulator, also called the Kobra, is the world’s first commercial open source based surgery simulator focused on oral surgery training. The Kobra provides co-located haptic feedback so that the user can feel the bone removal hands-on where it is visually located. The Kobra consists of a mannequin, touch-based control screen, pedals to operate the drill, two active 3D-glasses and high quality haptic interface. With the Kobra you also gain access to a growing library of simulated patient cases stored in the cloud. The purpose with the Kobra is to provide hands-on practice of surgical procedures without any risk for patients. Some procedures can be difficult to explain only in theory, such as the extraction of wisdom teeth. However, practicing on humans involves high costs, timely supervision and patient risks. The Kobra provides a good complement to practicing surgery on humans. Studies have shown that the best use of the Kobra simulator is when student and teaching surgeon can share the view and form a discussion about a procedure, such as discussing the approach angle and surgical strategy. With the big screen and two sets of stereo glasses the student and teacher can work together in a natural way, both seeing the patient in 3D. The simulated case is displayed on the big screen and reflected in an equal sized mirror. This creates a genuine feeling of working with an actual patient, as you are looking down while working and the virtual drill's position coincides with your hand. You can fold up and lock the mirror over the screen while the simulator is not in use. Through the use of a haptic device the user can intuitively operate the virtual drill seen on screen. Unlike most joysticks, a haptic device can give force feedback in three directions, enabling the user to feel surfaces, resistance and collisions within the virtual environment. Through a fast update rate, and explorative procedures, the user can trace surfaces and get an enhanced mental picture of the 3D structures of teeth and bone. The hardness of different tissue such as enamel and bone can be clearly felt while drilling. The Kobra has a touch-screen on the side, where students can log-in with their individual username and password, chose between different patient cases and save their results. Each patient case is built from CT-scans of an actual patient's jaw, and is embedded in a scene giving the appropriate view of the surgical area. The cases evolve around bone removal, separation of crown and roots and positioning the elevator correctly. The student has to follow a process defined by the teacher designing the case, for example that enough bone is removed before separation starts or that a tooth is sufficiently divided to be able to break it with the elevator. Forsslund Systems develops new cases on demand, based on your own CT-scans and preferences. All the cases are developed in collaboration between programmers, 3D-artists and oral surgeons to ensure that the cases are realistic and give the feeling of actual oral surgery. Since the simulation is accessed directly from Forsslund Systems' servers, the student can use any Kobra simulator in the world, log in and gain access to the growing library of cases. The saved results are centrally stored, and operations can even be replayed on a desktop computer. You can save measurements of the removed amount of bone, enamel, dentin and pulp. Reports are instantly generated, measuring if and how much the operator has carved into risk areas such as the lingual side of the wisdom tooth during crown separation, and damage to surrounding teeth. Studying the results the teacher can decide whether the student pass the case or not. The mannequin is based on a cast from a real patient, and provides accurate hand support for the operation at hand. The enclosing of the Kobra is made of high quality wood assembled in Sweden. Want to know more about how to use the Kobra? You can read our manual, and feel free to contact us if you have any questions! Please also see our order history and references about the universities that have acquired a Kobra system so far.